I am pleased to report strong results for Alluvial’s strategies this quarter. Alluvial has now completed three full years of formal operations, a milestone I was not sure would be reached when I began in 2014! Since its March 31, 2014 date of inception, Alluvial’s flagship Global Focused Value strategy has produced annualized returns, net of fees, of 17.6%. This compares quite favorably with the Russell 2000 Index at 7.1% and the Russell Microcap Index at 4.9%. I have been consistent in requesting clients assess Alluvial’s performance over time periods of multiple years. The small and often neglected or illiquid securities that are Alluvial’s focus often move (or don’t move) for no fundamental reason, and patience is required to see this investment approach to its fruition. In my view, a track record of minimum sufficient length to be meaningful has now been achieved, and I hope clients find Alluvial’s results acceptable. In general, I am satisfied with Alluvial’s investment decision-making processes and the results of those processes these three years. That does not mean I have not made errors. I certainly have and I have made efforts to discuss them candidly. But, I can say with confidence that I am better investor than I was three years ago. This is the result of constant effort to accumulate knowledge and understanding. An investor must never cease learning, because there is always more to know! More knowledge creates clearer sight, which allows better decisions and eventually, better results. I do not know if market conditions will be conducive to continued out-performance over the next few quarters or even years. I am exceptionally confident that Alluvial’s approach will continue to bear fruit over any reasonable timeframe. Alluvial is growing, and with growth always comes change. Alluvial Fund, LP commenced operations on January 1 and has already welcomed several limited partners. With the launch of the partnership, Alluvial’s separately managed accounts are now closed to new clients. I believe the new partnership offers several advantages over the separately managed accounts. If you are an accredited investor and are invested in becoming a partner, please let me know. 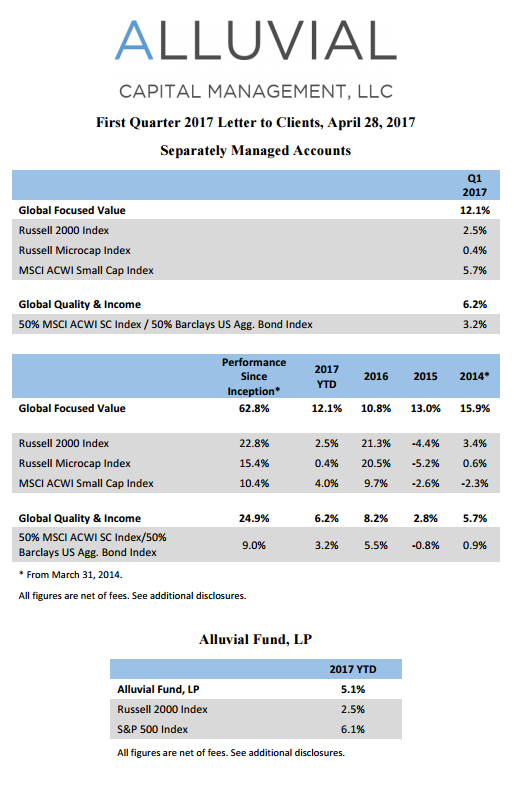 Since Alluvial Fund, LP is now Alluvial’s only open investment vehicle, I will no longer be reporting performance for Alluvial’s legacy accounts. Doing so would only invite confusion and distract from efforts to attract new partners for Alluvial Fund. Because of rules surrounding general solicitation I am limited in my ability to provide information and commentary on Alluvial Fund’s holdings and results to non-accredited investors. Writing two different quarterly letters, one for separately managed account clients and one for limited partners in Alluvial Fund is untenable, so I am currently assessing strategies for continued communication with separately managed account clients. Future quarterly letters to nonaccredited clients may be summary in nature. Regardless, Alluvial will continue to provide its services to both its separately managed accounts clients and to Alluvial Fund limited partners for the foreseeable future. But that’s the future, and this is now. Let’s discuss a few of Alluvial’s holdings and their pertinent developments.